When you take one look at our kids’ gym in Northbrook, there’s no doubt that we’ve taken some inspiration in our obstacles from the television show American Ninja Warrior. Why do we have such an interest in this show? Here are three good reasons. Many sport are great for the legs and heart. Sports like basketball, football, and baseball all keep kids running and pumping a lot of blood. But while throwing a ball gets the muscles limber, it doesn’t even come close to the exercises that require upper body strength. 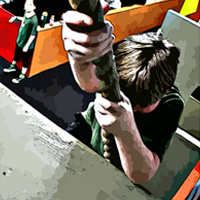 If you watch American Ninja Warrior, you’ll notice that much of the challenge is about arm and hand strength, something we also work out with climbing and ropes here in our kids’ gym. One thing we like about American Ninja Warrior is that there aren’t any bad boys. Doesn’t it seem like every sport has to have the anti-hero who’s gruff and always saying bad things about the opposing team? But on American Ninja Warrior everyone is having a great time while trying to do their best. At Hot Ground Gym, if you do your best, you don’t fail. We try to keep that mentality here during our children’s activities. If you bring your child into our Junior Boots or after school programs, you’re probably going to get an itch to try some of the obstacles yourself. Why? Because it’s a professional playground, and all of us have that urge to get back to our childlike state and just have fun. It’s great fun and an excellent exercise no matter how old you are! When you’re looking for activities for kids in Northbrook, nothing is going to beat the workout that kids will receive at Hot Ground Gym. Ready to bring them in for a FREE trial class? Contact us right here.